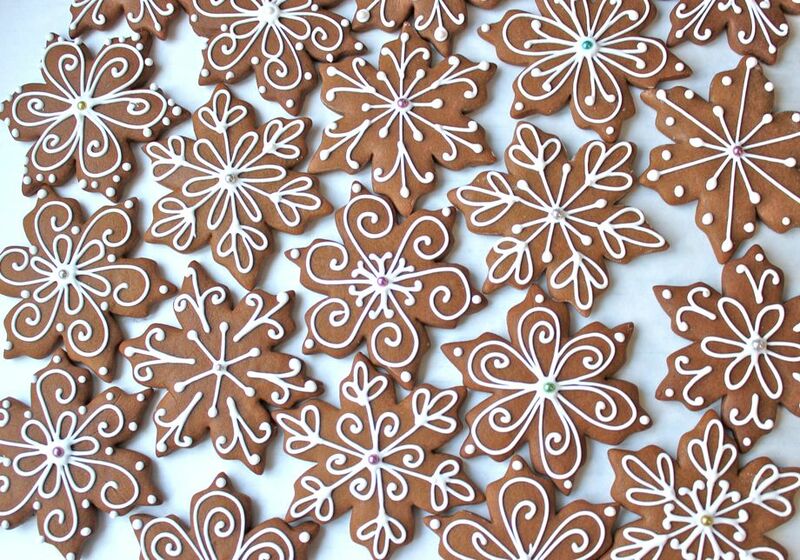 As the snow was falling from the sky yesterday, these gingerbread snowflakes were adorning my kitchen table. I sat there for hours, my pastry bag filled with royal icing, having too much fun decorating each and every one. I had baked the cookies a couple of weeks ago, and stored them (undecorated) in the freezer. The recipe I used can be found here, This is a crispy and spicy cookie with delicious gingerbread taste. The dough comes together quickly, and it rolls easily…maintains its shape, too! I did not use the accompanying royal icing recipe. CK Royal icing mix has become a favorite of mine…you just add water, whip and go. I used a PME 1.5 icing tip, and it was just the perfect size. I resisted buying any PME tip, especially the 1.5, because I thought, c’mon…is there really a difference between 1.5 and 2? And the PME tips are higher priced, for sure. Well…after working with my 1.5 yesterday, I’m here to say that there really is a big difference. My size 2 tip made the lines a bit too thick and the icing just seemed to flow effortlessly through the PME. So, Santa, hear my plea. Those PME tips come in 1,000 sizes (ok…maybe not). Just a handful for my stocking is all I ask. So pretty. Can’t wait to taste them! I know this is your kind of cookie ;-) See you soon! !